Photo by Lynette Golden Fitzpatrick. My grandmother called every kind of yarn "wool." The above is a vintage blanket she knit. And in addition to vintage, I should add "will survive the apocalypse" because it is squeaky and crunchy as acrylic gets. I feel like I can be a good friend again, on this blog. Maybe write on it, share some pictures and thoughts. I will be so very happy if any of you are left to read it. And...we have raised $700 so far for Stevanie and her kids! So cool. They are currently dressed for school in at least a few outfits they can rotate and wash and everything! You rock. We are here and we will read. 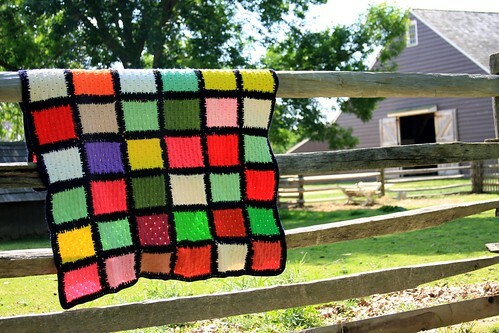 I have a similar grandma blanket, several in fact, that are oh-so acrylic-y. Still here. Can't wait to see the new book! glad that rock wasn't sooo huge that you couldn't get out again. You make even acrylic look lovely! That is a lovely picture with the sun shining through the colors. Can't wait to see the new book; when is it due? And I have several lovely acrylic things my Granny crocheted for me, a shawl, some toddler size dresses...so what if it's acrylic, they hold up well and I've been able to pass them along. In fact, I like to sleep wrapped in my shawl on very chilly nights. Yay! Happy to see you back. In fact, I like to sleep wrapped in my shawl on very chilly nights.